Karen Siems with some of the leather items available at her store. The very small village of Raeville, located in the northern part of Boone County, offers a unique shopping experience and ‘day trip’ for those looking for that ‘just right’ special gift. Prairie House Gifts’ inventory is stocked by local artists and craftsmen who are displaying their creations at the shop. 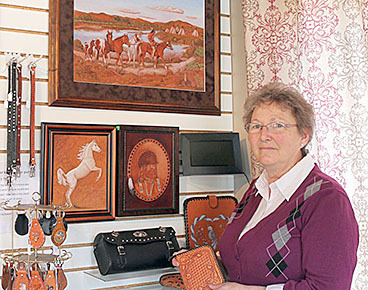 Prairie House Gifts owner Karen Siems has a selected array of her carved leather work and leather paintings offered for sale also. Opened in April 2015 in the front of her home, Karen wanted to offer those coming to town to tour St. Bonaventure Church and Rectory, recognized on the National Historic Registry, or to attend gatherings at the Rectory or visit the local cemetery, a place to browse for gifts or wait and visit while she contacts those in charge of the church tours. A bonus is making new friends from all over the country; many of them former Raeville residents. Today Raeville boasts of a population of 21 residents and has extended ties with former residents throughout the country. “When we wear our Raeville shirts to places (outside Boone County) we seem to always meet someone from Raeville,” Karen said. The beautiful, large twin-steepled St. Bonaventure Church brings many visitors to tour the building and see the glorious stained glass windows with German inscriptions. There is a new parish hall that offers needed room for large reunions or other gatherings. Karen found her niche in art as a leather-working artist many years ago after taking an art course that “covered every medium you could think of,” she said. Read more of this feature by Twylla Crosby in the March 29 Petersburg Press, Print and E-Editions.